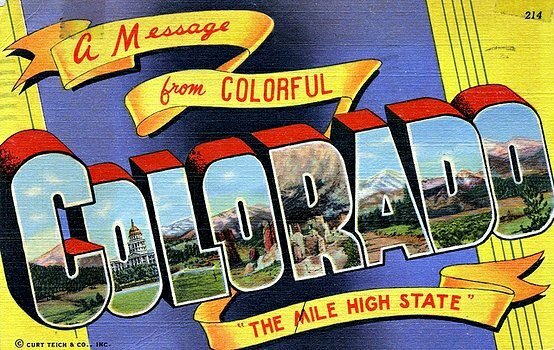 Colorado Red Posole recipe. 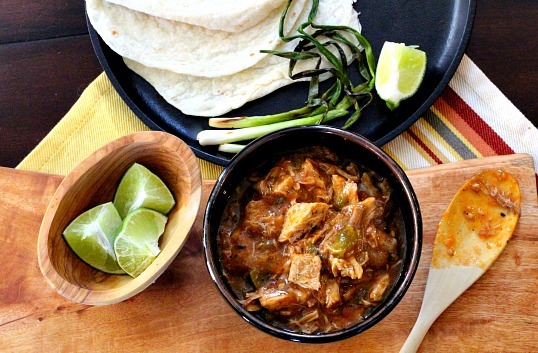 Red chili powder turns this pork soup stew into a wonderful southwestern Mexican dinner. 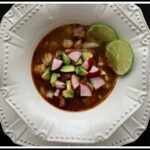 Ancho chile powder turns my Simple Pork Posole recipe into an earthy flavored, red brick colored bowl of savory bliss. Pork roast, smoky ham hock, chewy white hominy and Mexican seasonings make this one of our favorite soups. And with the Superbowl approaching, offering lots of little bowls with a selection of toppings, this is a great party food. Poblano peppers are one my go-to peppers to use in Mexican cooking. We love the flavor and the heat factor is perfect for us, ranging from a mild to medium hot. The ancho chili is the dried version of the Poblano pepper. Ancho chiles have a deep red color and a wrinkled skin. Sweet and smoky with a flavor slightly reminiscent of raisins. The ripened red poblano is significantly hotter and more flavorful than the less ripe, green poblano. I buy my ancho chile powder from Savory Spice Shop. Good quality spices are so important to any dish. 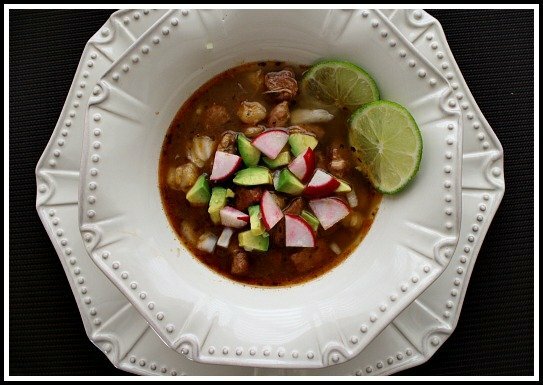 My red posole recipe is a result of studying several recipes and picking and choosing ingredients that favored our taste. And with any Mexican style soup, topping offerings can range from creamy cool avocado to the crunchy excitement of fresh radish. Every bite can be an adventure. Don’t forget a squeeze of lime and tortilla chips. I hope you give this red posole recipe a try. And if you do, please come back and let me know how you liked it and give the recipe a star rating. Your feedback is valuable to me for developing future recipes. And if you have a favorite posole recipe, let me know, I’d love to give it a try. Red in color with chili powder, this is an earthy version of Posole. If using dried hominy, soak the hominy a gallon of water for at least eight hours until it’s doubled in size. In a large pot, heat up the lard and cook the onion for 10 minutes. Add the pork and brown on each side for a couple of minutes. Throw in the garlic and cook for one more minute. Pour the water into the pot and add the ham hock, oregano, cumin, ground cloves and chile powders. Bring to a boil and then turn down to a low simmer. After a couple of hours, add the hominy to the pot along with the juice of one lime and the chopped cilantro. At this point, adjust your spices and add salt to the pot. Continue to cook on low for a couple more hours. Pour into bowls and serve with diced onions, lime wedges, chopped cilantro, avocado slices, radish and tortillas or tortilla chips. Colorado Red Colorado Posole …It’s What’s for Dinner. Oh, I bet this tastes great. Tons of ingredients in there! I still haven’t made anything with hominy. Thanks for showing me how to cook with it. Looks great! Really nice photo! Lea Ann, my husband is the posole king at our house. I will forward him your recipe right this moment. I have no idea what is going on with my blog. I’ve contacted my design person, I hope it’s fixed very soon. So odd, it’s fine on my computer and not readable on my husband’s computer. Thanks for letting me know. This looks incredibly rich and delicious, and I love your plates, what a great presentation! This looks just perfect. I am so fond of not only the ancho chile flavor but the hominy, lime and tomato together. This does look like a great dish dish for a Bronco-less Super Bowl. That Savory Spice Ancho Chili powder is very good. I’ve not purchased it any other place, so don’t know if it’s always that good. I have to agree with Kirsten…most of your post has a solid black background and you can’t see what you have written. Thank goodness your recipe had a yellow background. Have you changed WP themes? I’m in a panic. I don’t know why it’s readable on some computers and not on others. I’ve emailed my Blog Maven. I have a great source for ham hocks, so use them in a lot of soups. They can make things so much tastier. What a gorgeous photo and I love that bowl. I’m with some of the others. I can’t read anything but the recipe. The background is very dark and the print doesn’t come through. If it helps, I’m on Google Chrome. At least we can read the recipe 🙂 It sounds delicious, Lea Ann. Hope you get your blog type color problem resolved soon. Love this recipe and the method for creating it. It’s how I roll, too. More to do with what ingredients I have on hand, though. 🙂 And that photo is gorgeous. The colors just pop against that beautifully textured white dish! As for the blog colors – I have white backgrounds and can see things pretty well. I’m going to open it up in other browsers to see what effect that has. It’s the browsers. Internet Explorer and Safari and almost impossible to read because the background isn’t white. Chrome seems to work just fine. Well that’s just great. Man I hope I can get it fixed soon. Wow that sounds so good, loaded with the ancho. I have got to try that with the frozen pork shoulder cubes that I have in my freezer! Ancho chile powder is one of my favorites. This recipe rocks! I have never made a posole. I realize I am missing out something really good. P.S. you made a comment about the traditional cabbage rolls that I make. I use an Ina Garten foundation that includes raisins. I replace the crushed tomatoes with tomato juice. You can search it on the blog, and it will appear. Thanks Velva. I found it. LOVE ancho chili powder and I do not believe it gets used often enough!! I still have yet to make posole, but this may be what I needed to get me to want to!! Oh.. and I love Savory… I get most of my spices from them! I agree with you Jenn. Love that ancho chile powder. We’re looking forward to trying this. Your chile seasoning made this a winner. Whenever a recipe needs to simmer for hours, I prefer to use my slow-cooker. I happen to have a bunch of dried hominy I want to use. How would you adapt this recipe using the dried hominy in a slow-cooker. I figure the amount of liquid will need to be changed.